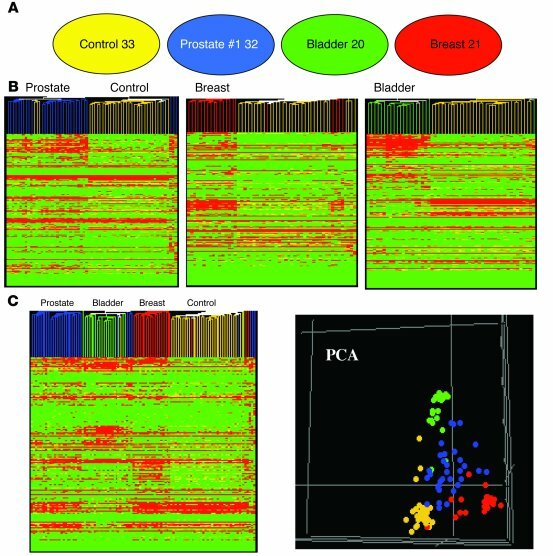 Unsupervised hierarchical clustering and principal component analysis of MS-based serum peptide profiling data derived from 3 groups of cancer patients and healthy controls. (A) Serum samples from healthy volunteers and patients with advanced prostate, bladder, and breast cancer were prepared following the standard protocol. The 4 groups were randomized before automated solid-phase peptide extraction and MALDI-TOF MS. Spectra were processed and aligned using the Qcealign script (see Supplemental Methods). A peak list containing normalized intensities of 651 m/z values for each of the 106 samples was generated. Numbers indicate the number of patients and controls analyzed in the respective groups. (B) Unsupervised, average-linkage hierarchical clustering using standard correlation as a distance metrics between each cancer group and the control in binary format. The entire peak list (651 × 106) was used. Columns represent samples; rows are m/z peaks (i.e., peptides). Dendrogram colors follow the color coding scheme of A. The heat map scale of normalized ion intensities is from 0 (green) to 200 (red) with the midpoint at 100 (yellow). (C) Hierarchical clustering of the 3 cancer groups plus controls (as in B). (D) Principal component analysis (PCA) of the 3 cancer groups plus controls. Color coding is as in A. The first 3 principal components, which account for most of the variance in the original data set, are shown.